In the heart of Moianès region you will find Cal Sabata, a country house which has been completely restored. It has been serving as a rural tourism establishment since 2002, falling into the category of independent country house (PCC-00763). It can accommodate up to 13 people, which makes it a wonderful option to spend a weekend with family or friends. 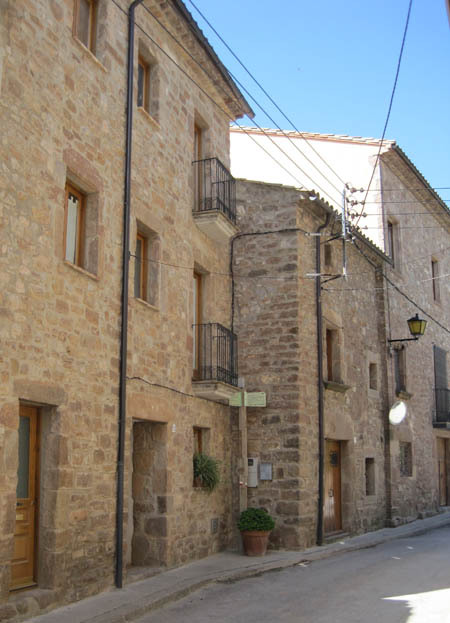 Our country house is conveniently located in the very heart of Catalonia, halfway between the Mediterranean sea and the Pyrenees, at around 900 metres above the sea level. The area is well communicated, not far away from major cities, and it enjoys a sunny and dry climate. It is therefore a very attractive place for an enjoyable stay during all seasons of the year. Moreover, the village and the surroundings offer plenty of options to spend a few days off and enjoy a trouble-free getaway. For the little ones we have a big garden and board games to offer, as well as other activities in the village, such as a playground and the local swimming pool.